DoAll mdl. ML 16” Vertical Band Saw s/n 5115833 w/ Blade Welder. Deckel mdl. SO Single-Lip Tool Grinder s/n SO/65-7590 w/Collets, Stand. Darex mdl. SP2500 Super Precision Drill Sharpener. Baldor Pedestal Carbide Tool Grinder. Baldor Pedestal Grinders and Buffers. Paragon mdl. E18S 2000 Deg Heat Treating Furnace. Campbell Hausfeld 225MAX Pro AC Stick Welder. DeVilbiss Pro-4000 6.5Hp Vertical Air Compressor w/ 80 Gallon Tank. Kobalt 3.5Hp Vertical Air Compressor w/ 60 Gallon Tank. Beverly No. B3 5” Hand Shear. Welch and Gast Vacuum Pumps and Vacuum Plates. 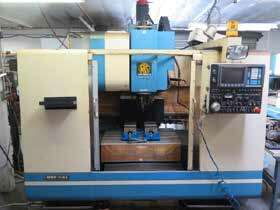 Tsudakoma 9 ¾” 4th Axis Rotary Table w/ Center. Huot Tool Scoot Tooling Cart. (7)Kurt and Parlec 6” Angle-Lock Vises. Wohlhaupter, Criterion and Enco Boring Heads. Harig 5” Magnetic Spin Chuck. 1990 Roku-Roku Vertimac-M II CNC Vertical Machining Center s/n 5793 w/ Fanuc 0-M Controls, 30-Station ATC, CAT-40 Taper Spindle, 6000 Max RPM, 16” x 36 3/8” Table, Coolant. 1989 Roku-Roku Vertimac-M 4-Axis CNC Vertical Machining Center s/n 5573 w/ Fanuc 0-M Controls, 30-Station ATC, CAT-40 Taper Spindle, 6000 Max RPM, 16” x 36 3/8” Table, Coolant. 1988 Roku-Roku Vertimac-K CNC Vertical Machining Center s/n 5637 w/ Fanuc 0-M Controls, 30-Station ATC, CAT-40 Taper Spindle, 6000 Max RPM, 16” x 28 ¼” Table, Coolant. Trump mdl. K3 FLC 3-Axis CNC Vertical Mill s/n K3FLC-123 w/ Centroid CNC Controls, 30-Taper Spindle, 10” x 50” Table. 1997 Femco Durga-25E CNC Turning Center s/n L5EC641 w/ Fanuc 0-T Controls, Tool Presetter, 12-Station Turret, Hydraulic Tailstock, Chip Conveyor, 8 ½” 3-Jaw Power Chuck, 16C Collet Nose, Coolant. 1999 LNS EcoLoad-L Automatic Bar Loader/Feeder s/n 1327-99. Lagun FT-2 Vertical Mill s/n 2933 w/ Acu-Rite MillMate DRO, 1.5 Hp. Motor, 65-3000 RPM, 8-Speeds, Chrome Ways, Power Feed, 9” x 48” Table. Hardinge HLV-H Wide Bed Tool Room Lathe s/n HLV-H-1283 w/ 125-3000 RPM, Inch Threading, Power Feeds, Tailstock, 5C Collet Closer, Tool Post, Trava-Dial, Coolant. Sunnen mdl. MBB-1600 Precision Honing Machine s/n 44237 w/ 12-Speeds, Coolant.